We all know the saying, “blood is thicker than water.” But what happens when your parents are the ones set against each other? 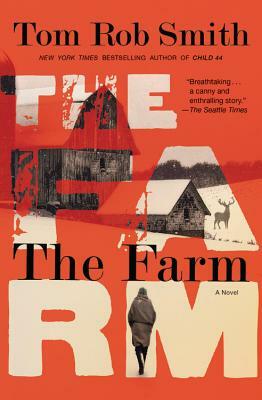 In Tom Rob Smith’s latest novel, The Farm, this is the situation narrator Daniel faces; being a man who has to judge his parents and find out who is right and who is wrong. This searing novel never lets up. It hits the ground running from page one, and doesn’t stop until the last page is turned. As each piece of evidence is laid out before Daniel he had to decide if there is a small town conspiracy, or if it’s just the ravings of his mother who has gone slowly insane. This is one can’t-miss novel for anyone who enjoys exploring the darker side of humanity and the meaning of family. Tom Rob Smith graduated from Cambridge University in 2001 and lives in London. His novels in the Child 44 trilogy were New York Times bestsellers and international publishing sensations. Among its many honors, Child 44 won the ITW 2009 Thriller Award for Best First Novel, The Strand Magazine 2008 Critics Award for Best First Novel, the CWA Ian Fleming Steel Dagger Award, and was longlisted for the Man Booker Prize.